Gone are the days when terms such as sleek, stylish, premium, and attractive only described the high-end laptops. Acer manufacturers understand that the demand for budget-friendly laptops is growing day by day. The company has continued to bring their portfolio of laptops at affordable prices to meet the requirements of budget-conscious users. 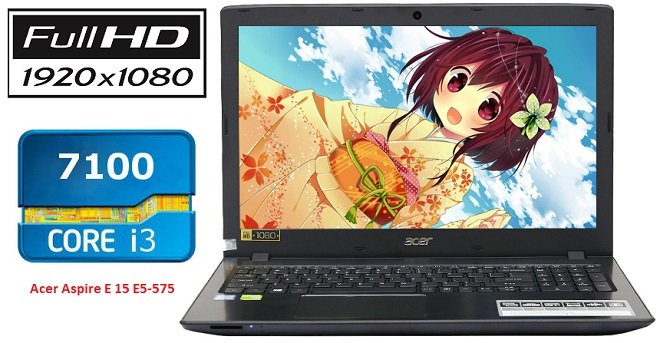 Besides producing inexpensive laptops, Acer has also marked new standards of delivering high performing laptops such as the current Acer Aspire e15 i3. Acer Aspire E 15 E5-575-33BM is one of the best laptop under 400 USD that will suit the needs of an everyday user who engages in multiple tasks such as watching YouTube, surfing the web, Skyping, Matlab as well as office work that involves PowerPoint, MS Word, Excel sheets, etc. Besides having all the typical features found in good quality laptops, the manufacturer has gone ahead and added other exciting nuggets including Full HD display, type C USB 3.1 port, as well as a VGA port. This makes this mode one of the best Acer laptops in the low budget ranges. Acer Aspire E 15 E5-575-33BM comes with a chassis that has a brushed metallic that makes it quite classy. Although this laptop has a plastic feel, it is not a great deal since most laptops in this price range often come with a plastic chassis. In fact, this construction makes it lightweight and easy to carry. In addition, this laptop comes in an all black color variant with matte as well as shiny feel. This gives it an industrial feel, which most users would like to have. When it comes to the dimensions, this model comes with standard sized that you would expect from a 15.6-inch laptop. It weighs around 5.3 pounds and measures 15.0 by 10.2 by 1.2 inches. This laptop features a 15.6-inch Active Matrix TFT LCD LED display that has a resolution of 1920 by 1980 pixels. This means that is a Full HD display that allows you to watch high-resolution videos and view crystal clear pictures. This display is backed by patented Comfyview technology that reduces light reflection for comfortable viewing. Additionally, the display is enhanced by Acer ColorBlast technology for allows for richer colors. Considering its price, Acer has done a great job in offering an impressive display that will be more than enough for an everyday laptop user. You can enjoy doing your projects, office work and watch movies with a laptop that gives you the best display possible. The best part with this low budget laptop is its performance. It is packed by a high performing 7th generation presser and a high RAM standard. This model is powered by Intel Core i3-7100U processor, which was released in the middle of 2016. This processor belongs to the Kaby Lake microprocessor. The overall performance of the processor is great for handling everyday tasks even when running high processor demanding applications. When it comes to RAM, this processor support LPDDR3 and DDR4 SDRAM standards only. So, this machine comes with a 4GB DDR4 SDRAM, which is powerful enough for handling daily usage. It also comes with a 1 TB HDD which is enough for most users although you can purchase larger capacity hard disk more storage is needed. Although Acer claims that this laptop comes with a battery life of 12 hours with a single full charge, we expect it to offer at least 8 hours of battery life on a single charge. It is fitted with a 6-cell LI-Ion 2800mAh which is non-removable. The quality of the keyboard is commendable. It comes with a full-size keyboard that has a backlit feature. The keys feel great and have a brisk action, good feedback, and short key travel. If you always have trouble when it comes to resting your hands while typing, this laptop is a great choice. It offers you with a well-designed keyboard deck that gives you good space for resting your hands. The trackpad has a smooth texture and supports most of the common multi-touch gestures. Acer Aspire e15 i3 runs windows 10 home variant out of the box. Windows 10 need no introduction to most individuals and is the leading operating system in the world. We felt that the hardware is well configured with the OS so, you do not expect to feel any lag or hiccups in the software performance. Similarly, it is possible for you to take advantage of Windows 10 such as windows app stores, productivity, as well as compatibility. In addition, this model comes with Acer’s proprietary software such as Acer ExaColor as well as Skype for business. Gaming on this Laptop is OK. The laptop comes with integrated Intel HD Graphics 620, meaning it offers average graphics rendering. Although it will handle graphics intensive benchmarking applications, as well as flash players, quit well, it will struggle when handing high-end games such as Fallout 4 and Far cry. If your primary requirement is gaming, this laptop might not be the best choice. Overall, the Acer Aspire e15 i3 is perfect for any individual who wants the best laptop under 400. It is hard to get any other laptop that offers better specs at this time and price.